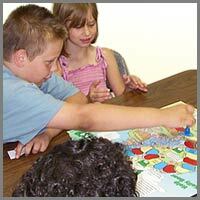 A Cooperative Journey Game for grades K-5. 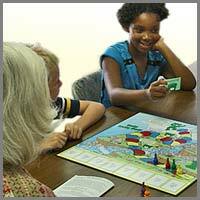 The game works best with 3 to 6 players, ages 5 - 10; however, children of other ages may also enjoy playing. The adult may choose to play along with the children. 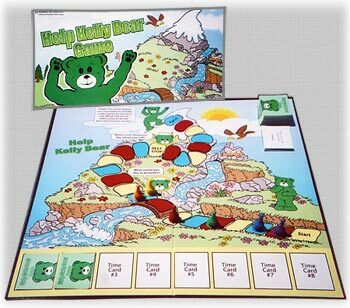 An 18" x 18" game board of a mountain landscape with individual stepping stones from the bottom to the top. Over 100 playing cards. 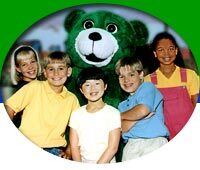 On one side of each card is Kelly Bear's face and on the back of each card is a question. 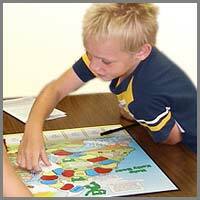 The questions focus on feelings (25), self-understanding (25) and character traits (50). The cards are coded by subject and level of difficulty so that the card selection may be tailored to match the needs of the players. Eight "Time Cards" are designed to generate ongoing excitement in the group. Detailed directions that include a listing of the questions that appear on the cards.